Apple will bring voice control to the next level with this week's launch of the iPhone 4S, leveraging its acquired Siri technology to allow users to perform complex tasks by simply speaking aloud. Leading up to this Friday's launch of the iPhone 4S, AppleInsider will offer a closer look at some of the features of the next-generation handset. Given that the 'S' in the device's moniker was never officially defined by Apple, five potential definitions are offered. Today: 'S' is for Siri voice control technology. Siri was originally a free application for the iPhone available on the App Store. The "personal assistant" software allows users to speak in natural language to accomplish tasks like buying tickets to a movie. In addition to offering handsfree functionality, it was also pitched by the company as a time-saver. "No more endless clicking on links and pages to get things done on the Internet," the company's official website said in 2010. "Delegate the work to Siri and relax while Siri takes care of it for you." In asking the Siri software to find a local Italian restaurant, the application would scour the Internet for multiple sources of information including reviews, maps, and the ability to share with others via e-mail. It could also obtain a reservation to a restaurant using OpenTable. The technology so impressed Apple that it acquired Siri in April of 2010. Since then, Apple has been working to integrate the features in iOS 5, the operating system that powers the iPhone 4S. Leveraging the power of the A5 processor, Siri will only work on the iPhone 4S. And because it's built into the operating system, Siri will offer much more than before, integrating with a user's contacts and calendars, and allowing them to accomplish complex tasks like composing an e-mail or sending a text message. Apple has portrayed Siri as the ultimate voice recognition solution, fully replacing the "Voice Control" functionality that debuted with the iPhone 3GS in 2009. 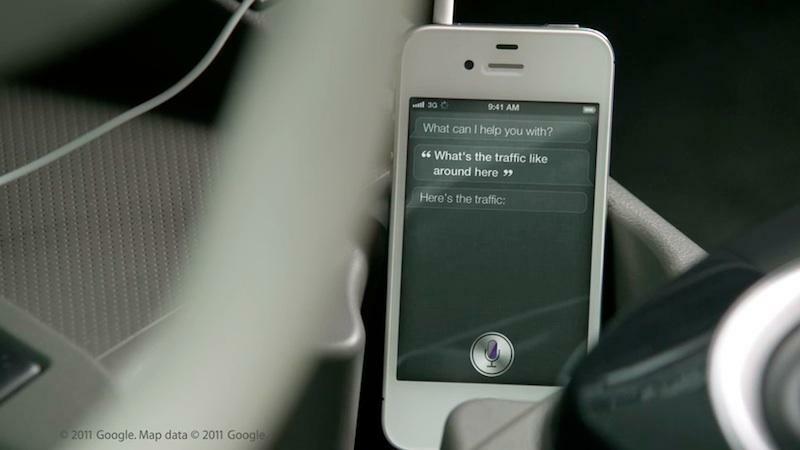 But unlike its predecessor, Siri allows users to talk to their iPhone as they would a person. The technology in Siri allows users to speak to their iPhone 4S in natural language, much like having a conversation. For example, saying "Are there any good burger joints around here?" provides a list of local burger restaurants. The user could then follow up with "How about tacos?" and Siri remembers that the previous request was related to restaurants. But from there, Siri goes beyond what was offered in its original incarnation on the App Store. Users could then text their friends about eating at the chosen restaurant, and set a calendar event for those plans. The system will even inform the user if there is a conflicting event on their calendar, and offer them the ability to reschedule. "A lot of devices can recognize the words you say," Scott Forstall, Apple's senior vice president for iOS Software said in an official promotional video. "But the ability to understand what you mean and act on it, that's the breakthrough with Siri. It completely changes the way you think about what a phone can do." While Siri is powered by the A5 processor and the Siri software acquired by Apple, the company is also believed to have partnered with Nuance Communications, makers of Dragon NaturallySpeaking, to help understand users' voices. Neither Apple nor Nuance have confirmed that Nuance's technology is featured in Siri, however. One person already has their hands on an iPhone 4S, and used it to show off some of its features on video, including the settings associated with Siri. In that video, it is shown that users will be able to invoke Siri by holding the iPhone's home button, or raising the iPhone 4S to their ear and speaking. The "Raise to Speak" function can be turned on or off in the settings. The "Voice Feedback" feature of Siri, in which the system will speak back to the user, provide confirmations and ask questions, can also be changed from the iPhone's settings. In the video, Voice Feedback is set to "Always." Users may also change the language for Siri. At launch, the feature will come with built-in support for English, German and French. The software will be in beta at launch, with more languages and services to be added over time. Siri will work immediately on the iPhone 4S with no setup from users, but Apple executives promised at last week's keynote that the software "gets better" as it learns an individual person's voice. A comprehensive list of things that can be said to Siri was put together last week by TUAW. 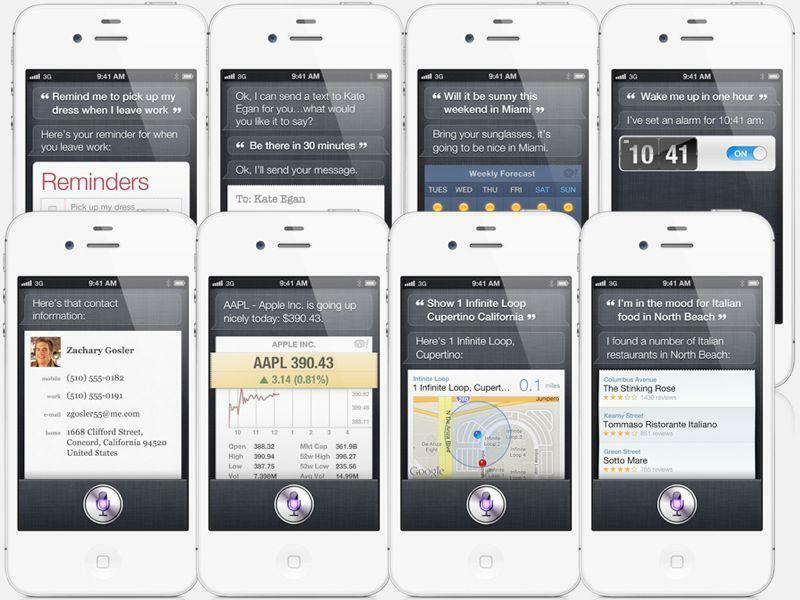 It shows that Siri has access to an iPhone's Address Book, Calendars, Alarms, E-mail, Friends, Maps, Messages, Music, Notes, Phone, Reminders, Stocks, Weather, and Web search. Most of the potential uses in those categories are self-explanatory: Users can place phone calls, add events to their calendar, check the weather, set an alarm, compose an e-mail or text message, find directions, or play music. Siri also ties into the new Find My Friends feature of iOS 5. Leveraging iCloud, it will allow friends and family to easily locate one another using iOS device features like GPS and 3G data. Potential commands include "Where is my sister? ", "Is my wife at home?" and "Who is here?" Using Siri, users can even specify which search engine they want to use in finding information on the Internet. Examples include "Google the War of 1812," "Search Wikipedia for Abraham Lincoln," or "Bing Alicia Keys." Siri also allows users to specify what type of search they are interested in conducting, and understands commands like "search the news." Dynamic information such as currency exchange rates, the price of gasoline in Chicago, or the date of the next solar eclipse can also be obtained through Wolfram Alpha. In a demonstration at last week's iPhone 4S, Forstall asked Siri how long until Christmas. The software responded: "82 days." Siri also does dictation, as a microphone icon will appear anytime there is a keyboard on the screen. By tapping the microphone, users can speak rather than type. The learning functionality of Siri can also be prompted by voice, as users can dictate data to the software, allowing it to learn personalized information like relationships. For example, a user can tell Siri the name of their mother so that commands such as "Call my mom" can be understood. And if a user is unsure how to use Siri, they can even ask the system itself for help. Just ask Siri "What can you do?" to learn the full range of voice command options with the new iPhone 4S.